Come to us with your sketches, hand made mockups, or just a vision in your head and we'll turn it into a 3D Computer Model for your review. We have CAD certified engineers on staff to help turn your vision into reality. We're happy to provide a complete product designing package, whether you need design-for-manufcaturing assistance, methods of production comparisons, industrial design, and full mechanical engineering services. If you need an idea turned into a 3D CAD model for prototyping or you need full engineering support, we're staffed to meet the challenge. We provide 3D printing of parts and assemblies, post-print surface finishing, and provide consulting services for additive manufacturing part development. The FDM (Fused Deposition Modeling) printer uses in a range of materials including PLA and ABS depending on your needs. If you have something already designed and ready to print, or need further assistance with the design, we are ready 24/7 to meet your requirements. We provide NEW conceptual drawings, starting from scratch, customer sketches, or other material. Sketching remains the fastest and most direct method for designers to get ideas out on paper. Quickly sketched visualizations can help simplify and compress data far more efficiently than language. Our industrial designers are on call, ready to sketch away. Our rapid prototyping service is often used to produce a physical sample of a product design. It can be used to evaluate the form, fit and function of a part or to test out new and innovative idea. Prototypes are often made quickly using cheaper and less robust materials. We produce “rapid” prototypes because many clients need to produce a physical part quickly in order to validate a design or to capture a sales opportunity. Did a piece of your tent break and you can't afford a new one? Or maybe your competitor just came out with a new temperature probe enclosure for military aircraft turbine engines and you want to keep up? No part is too small or too complex. Send us over the part you need replicated and/or any supporting documentation. We can transform your existing 2D parts and assemblies into fully 3D solid CAD models ready for print, test, or simulation. 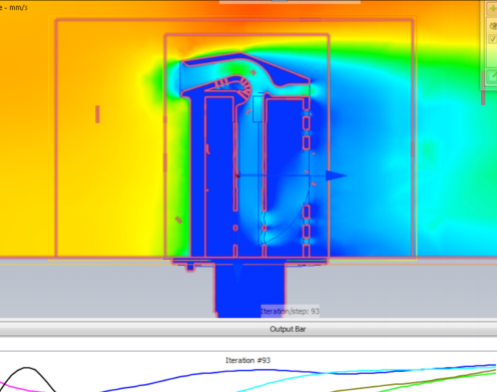 Using CFD software, and other simulation packages, we can provide detailed simulation reports to help you perform stress analysis, predict product performance, optimize designs, and validate product behavior before manufacturing. This comes with the added bonus of a fleet of excellent product photos for instruction manuals and sales literature. Along with the creation of your model, we can also provide fully dimensioned drawings for production. These drawings can be used for your manufacturing team, or can be sent out for quote from various metal fabricators in your area. What good is a fully modeled product line without some instructions of how to assemble it? We can provide easy to follow assembly drawings similar to what you might find in a Lego kit, complete with a Bill of Materials and quantities of each component and suitable for quoting, costing, product promotion, and production of required manufacturing tooling.